Normally, there is not much to say about a rout other than one team is much stronger than the other. Although the readers that come here are not as numerous as those who go to other sites for Oregon sports news, they love to kick the concepts around and ponder as I do. And this has been the best season for me ever in terms of writing, as I’ve not had to do an analysis article every week and can publish my combo article of opinion and analysis like I’ve never been able to do before. In fact, I’ve never seen this combo type of article before anywhere, and it has been fun to share thoughts after the games this season. I will have another after the bowl game and will continue to write editorial or opinion articles most weeks of the year as I discussed before. I had other conflicts yesterday and could not stay up late to write this, hence the later Sunday afternoon publishing time, but I invite your thoughts as always. So many of you are people I would enjoy meeting and talking to–even though my only contact is through this site. When I see the handles of many that write here in response, they seem like old friends to me, and I just wanted to say “thanks” for the ongoing fun. I try to be objective within my highly subjective views of Oregon football (if that makes any sense) in that I call things both positive and negative as I see them. That means that when people or circumstances change, so will my commentary. The best example is what is occurring on offense: Mario Cristobal has made this offensive line tough, while retaining the mobile attack components that these players were recruited for in the current playbook. This game featured a new play variation that one of the analysts will take time to break down in the near future. It has the components of the Outside Zone (no reading of defenders) and the Sweep, yet it is different from both. 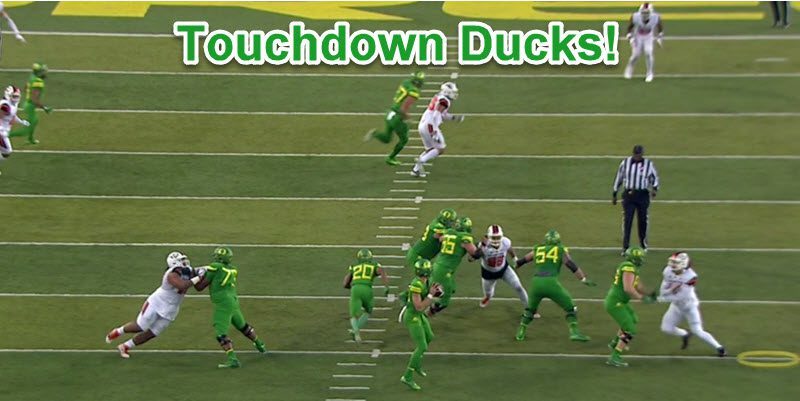 It is a derivative that many in the NFL would simply call a “Stretch” play, but it is tailored to the talents of this offense line who, along with Royce Freeman, skewered Oregon State with it. Isn’t it amazing–the massive, disproportionate impact of a talented quarterback? 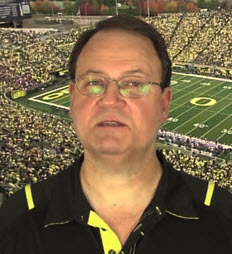 I still marvel at how the loss of Marcus Mariota, Vernon Adams, or Justin Herbert during those seasons could have impacted the fortunes of hundreds within the CAS Center. Oregon scores over 51 points a game with Herbert playing and only 15 points a game when he doesn’t? His influence over the entire team, including the defense, is clearly visible to us fans, and we just have to enjoy it while we can. 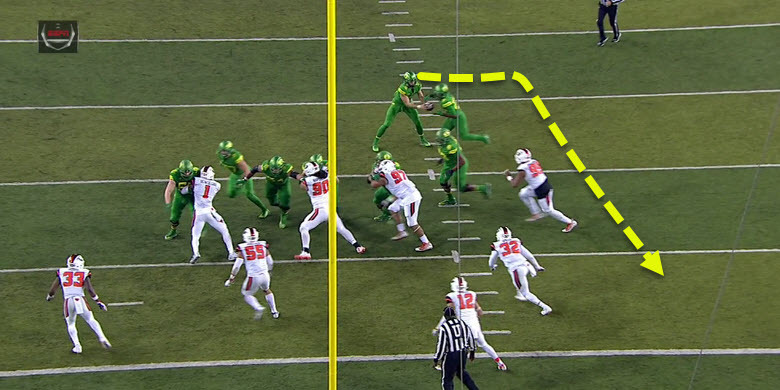 Even in the second half of this Civil War game, everything changed when Herbert was done for the day, and while it is crucial to have an adequate back-up, it is much harder to keep back-ups happy and on the team, as we witnessed last spring. How do we solve that, my friends? Oregon State was Seeing Redd? Jaylon Redd explodes through a gap on the Jet Sweep to score. 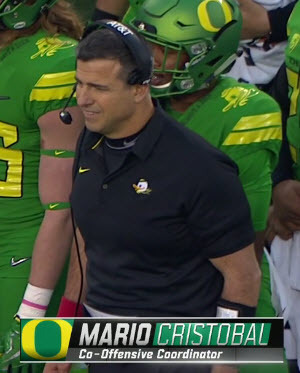 One of the more entertaining aspects of watching college football is seeing the emergence of a player who realizes, “I can do this,” and thus begins a productive career with our beloved Ducks. We saw that happen again on Saturday when Jaylon Redd hauled in a big pass as a receiver and scored a touchdown on a Jet Sweep. I especially noted his ability to run the Jet Sweep better than Taj Griffin, who has the speed, but not the judgment with cuts or acceleration at optimum moments. Did we just watch the Charles Nelson baton get passed to another diminutive speedster? Redd now has his confidence, so look out! Ducks Defense is Routine; Brilliant Again! How about the defensive game plan of the last two weeks? Jim Leavitt knew that neither team could outscore Oregon via passing, so he put our corners on an island (man-on-man) and lived with the occasional pass interference or big play. Percentage-wise, the limited success passing by the opposition would not have been enough to beat the Ducks, and man coverage allowed the Duck defense to put more defenders in the box to stop Khalil Tate and, yesterday, Ryan Nall. This is a strategy that Nick Aliotti never got credit for; you cannot do it all, as Oregon does not have as talented a defense as offense, so you play the percentages. What can you do to hold the other team down as reasonably as possible while creating turnovers? Whereas Nick did not have the talent of an SEC defensive roster, Leavitt is still building his with a ton of underclassmen, so they play the percentages. The job that Joe Salave’a has done with the defensive line is astounding and will be studied in the off-season. The use of Austin Faoliu at defensive end with Jordon Scott in the game at the same time was very disruptive to the Beavers. Are we seeing the Henry Mondeaux defensive end torch being passed to the true freshman? The way this year’s defensive line defeated blocks just enough to cover their gaps was the antithesis of what we witnessed last year. 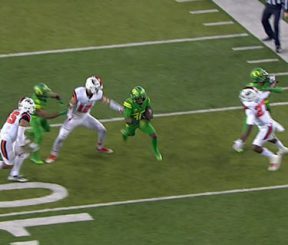 Jalen Jelks is really getting his timing down for deflecting passes, and after one was swatted up into the stands, I wished for it to get popped up into the air, and he delivered! I hope he stays another year, as the coaching from this staff could help his game significantly from here (and add some weight). 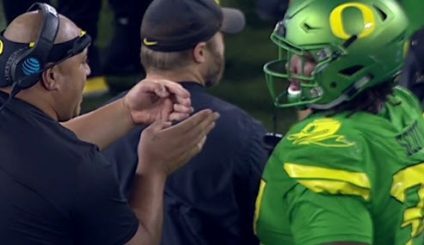 The video above is a testament to the coaching of Gary Campbell and Donte Pimpleton as running backs coaches for the Ducks. You’ll see that Kani Benoit approaches the hole to his left, and the Beaver linebacker moves to fill the gap. Then, Kani cuts away from that hole and to the right for an opening that no linebacker has filled–thus, six points. It was fun to see Kani get his opportunity, and this is something both coaches should take pride in. My friends … as I explained before, we will have a reduced article schedule, but look for them on Mondays, Wednesdays, and Fridays. Tomorrow, we’ll have a killer article about this Ducks football team from a former college player who has written pieces that have drawn a ton of praise in the past. Do not miss it!